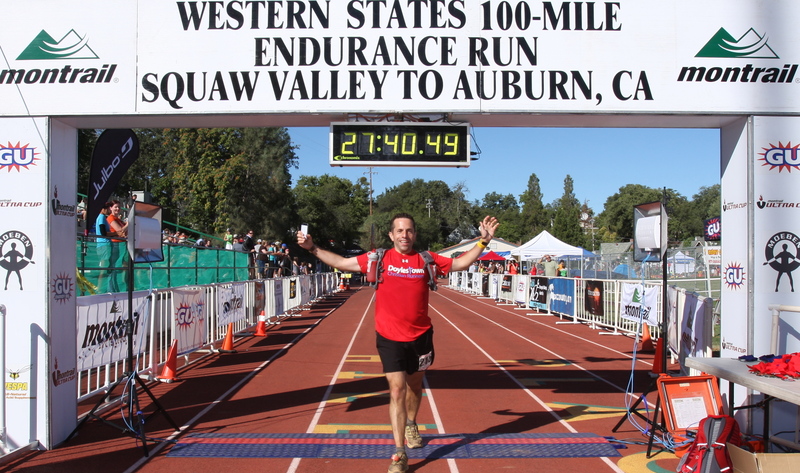 The Western States Endurance Run (WS100) is like no other Ultra-marathon for so many reasons. In addition to being the oldest 100-mile race in the world, it offers amazing views and follows trails steeped in American history. The race attracts the best runners from all over the world on a course which offers a challenging mix of altitude, heat, water crossing and various types of terrain. Based on this, it is no surprise that gaining entry to run WS100 is extremely difficult. I would suggest it is as difficult as combining the requirements for The Boston Marathon and New York Marathon – you have to qualify as you do for Boston but you must then enter a lottery like New York with a much smaller number of slots. Unfortunately charity entries aren’t an option but elite spots are available for the previous year’s top 10 male and female finishers as well as other talented winners from other select races around the country. Even with all the history and being one of the select few who ran this year, it was the people that truly inspired me and made this race more special than I could have imagined. The race organizers, volunteers, crews, fans, and my fellow runners made this an amazing experience that has made this the only 100-mile race I can only hope I will be given another chance to compete in. The weeks, days and hours leading up to the race went as well as I could have hoped. In the 4 weeks prior to my 2 week taper before the race, I had logged over 350 miles that included 3 x 100 mile training weeks. It was a very aggressive training cycle but one which I made it through feeling healthy and strong. My taper went well right up until the night before the race. 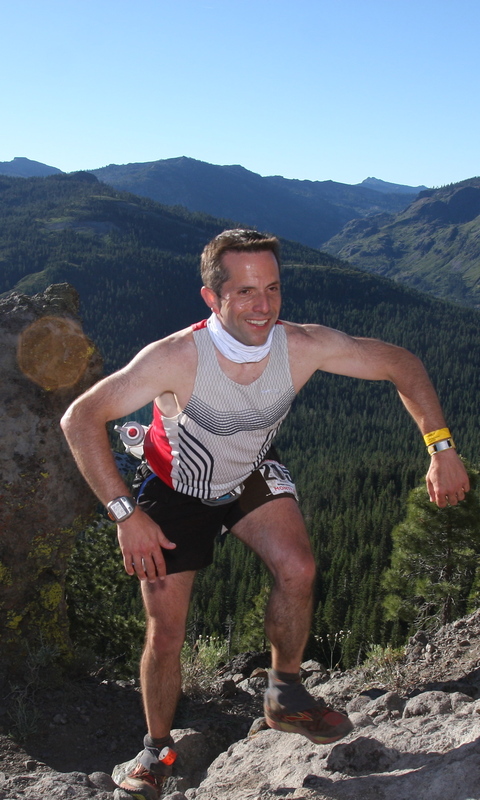 Karl “Speedgoat” Meltzer has won more 100’s than anyone! Although I arrived in California a few days before the race, I did my best to stay on East Coast time and woke up feeling good at 3am PST on June 28th. I thanked the Lord for getting me to this point, for feeling so good, and asking for His presence to be with me that day. I was excited the day had finally arrived and headed to the start at 5am. I would not have changed anything leading up to this point and believed that breaking 24-hours once again was definitely achievable. The Start, The Stop, and The Problem? Lining up at the starting line in Squaw Valley at 6000’ was electric. The crowd of runners, their families, volunteers, and spectators huddled before the start with temperatures in the 40’s. The mountains stood waiting before us to begin our accent to the Escarpment at 8700’ in just over 3 miles. The sun was just beginning to peak over the mountains and the crowd began to count down from 10 in unison before we took off. The climb to the top was a mixture of hiking and a slow jog. I was patient and never felt like I was pushing myself too hard which was part of my plan. I reached the summit and looked over my shoulder to see the amazing view with Lake Tahoe and the sun rising. It was a quick glance before beginning my long decent to the first major aid station (AS) where I had my first drop bag. It was a beautiful morning and I was running with a small group at a conservative pace. It was probably about 10 miles into the run when I needed to make my first of several pit stops in the woods. Many race reports may not share these details but I believe it is important given that I have Ulcerative Colitis. I want to let others know who have this condition know that it is not the end of the world. I am fortunate that I have been able to compete in races at various lengths and attribute my running in helping to keep my condition under control for years. I was not worried when I had to stop as I knew it would be a long day and had plenty of time to make up any lost time. However, I had not anticipated another unforeseen challenge that may have been a factor for the rest of the race. At the race briefing the day before, they recommended that we use a bandana around our mouth if the dust got bad when coming down from the Escarpment. They mentioned that this was volcanic dirt and contained silica particles which could impact some runner’s breathing. Given how dry it had been in California, I purchased a bandana to be safe given my pneumonia in April and history of asthma. After climbing out from the woods to take care of business, I joined a long conga line of runners which had at least 20 people in front of me. I remained patient but there were many more people running in front and behind me than before my quick detour. As a result of all these additional runners, plenty of dust was being kicked up. While I did use the bandana occasionally, I found it was stifling at times and I eventually kept it off. I debated on even sharing this since I may never know how much this ultimately played into my performance for the rest of the race. However it is the only thing that I will take more seriously if given another chance to run this race. above and beyond in creating this one of a kind cooling unit. 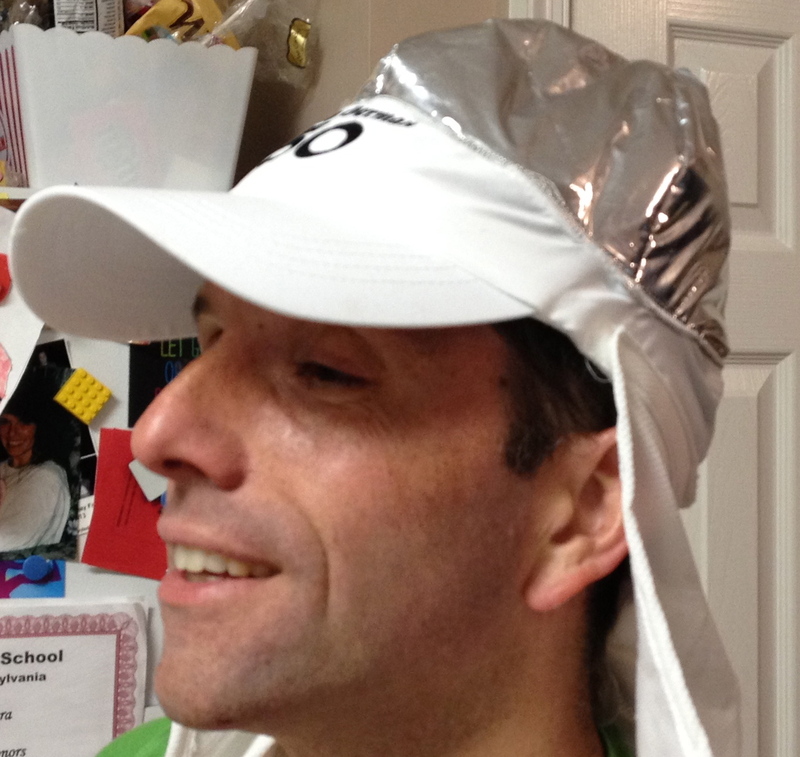 It was basically a hat that contained lining on top that would hold ice. I then grabbed my 2nd water bottle and took off for the next 13 miles of downhill. I was running well but was having trouble catching my breath at times. It was also getting warmer but I felt like my ice cap was keeping me cool and really did a great job throughout the whole day. At the bottom of this long decent, I crossed the American River using a cable since the Swinging Bridge that had been used in the past was destroyed by the forest fires of 2013. I then began one of the most difficult climbs up Devils Thumb. It was a section of the course I had run on a previous trip to California and knew it was going to be a challenge up the 38 switchbacks to the top. A fellow runner saw I was struggling and offered me some Mountain Dew. I had plenty of water and gels but the idea of some soda peaked my interest. He had filled one of his water bottles with the fluorescent caffeine beverage and squirted a mouthful down my throat. It wasn’t only refreshing but I adopted his beverage of choice for one of my 2 bottles over the next half of the race. Even with this slight modification, I believe my nutrition plan that included Heat Guard, gels, PB&J, bananas and eventually chicken noodle soup, worked for me. I knew I could pause at the aid station at the top (mile 48) to regroup and refocus. I arrived there out of breath and asked for my drop bag. The volunteers at every aid station in this race were incredible. They assigned a person who stayed with me the whole time I was in an aid station. They filled my bottles, got me food, or anything else I needed. They also moved you along if you decided to hang out for too long. Here at Devils Thumb AS I sat down to put on a pair of dry socks and change from my Brooks Cascadia’s to my Hoka Mafates. Unfortunately I shared that I had a nice blister forming to the volunteer who was helping me out. She called over a medical person who decided to lance it. It wasn’t a big deal but it is the last time I will make that mistake again unless it is really causing me a problem. I left Devils Thumb after a much longer than expected stay and headed back down to El Dorado Creek AS (mile 53) and back up a long climb to Michigan Bluff AS (mile 56). Jim was waiting for me there and could see I was struggling. I shared that breaking 24 wasn’t in the cards today which he already figured out on his own. As a result, he informed me that he planned to join me at Foresthill AS (mile 62), 18 miles and a major river crossing earlier than I had expected. This news and the concern that I might run out of daylight gave me energy to pick up the pace. I had left a headlamp at Foresthill since I thought I would be there well before 7pm, plenty of time before we’d lose daylight at around 9pm. Unfortunately I didn’t leave Michigan Bluff until 7:30 and rushed to cover those next 6 miles in less than 90 minutes to avoid being lost in the dark. The Night and Something I Can Never Say Again! I arrived at Foresthill where I got on the scale for my 5th of nine weigh-ins. While I had lost almost 8lbs at one point, I maintained my weight within 5lbs for most of the race. As night descended upon us, I began my transition to chicken noodle soup as my fuel of choice (along with Mountain Dew in one of my bottles). We took off down Cal Street for the next 18 miles to the river. Having Jim with me was such a blessing. I knew a sub-24hour finish had long since slipped out of reach for me and although my goal was to finish, I enjoyed his company, support, and guidance given Jim’s knowledge of the trails. The willingness to help others is what drew me to the ultra-community and Jim embodied this given all his help to someone he had known for less than 48 hours. Running past midnight is always accompanied with the desire to sleep and rest for me. However I have always fought this temptation in my previous three 100 mile races based on a strong desire that kept me focused. At my first, Chimera 100 I wanted to finish, during Leadville 100 I wanted to break 25 hours, and at Pinhoti 100 I wanted to break 24 hours. These goals were all achieved as was my ability to fight my exhaustion. I never questioned whether I’d finish at WS100 but with the sub-24 goal out of reach, I was losing the battle with sleep and began sway on the course. Jim was concerned and asked if I was feeling alright. He told me I looked drunk and I suggested I rest for a few minutes at the next aid station. One of the common questions I get when people hear I run these races is “Do you stop and sleep?” I have always let others know that stopping is usually for a bio-break, to refuel, or to change sock/shoes but never to sleep. 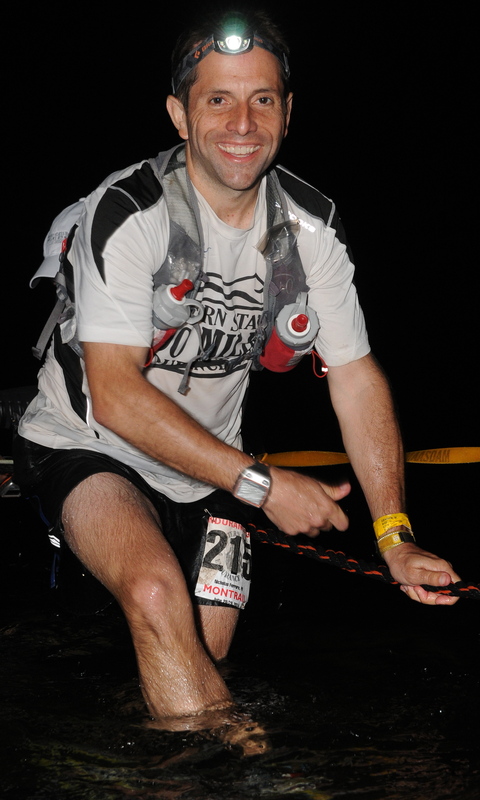 WS100 changed that for me when I decided to crash for 15min at 1am in the Ford’s Bar AS (mile 73). I ran in, told Jim what I needed in my bottles, laid down, and 15 minutes later Jim woke me. I jumped up and we took off down to the river with a cup of chicken noodle soup in my hand. Jim was much more than a pacer! 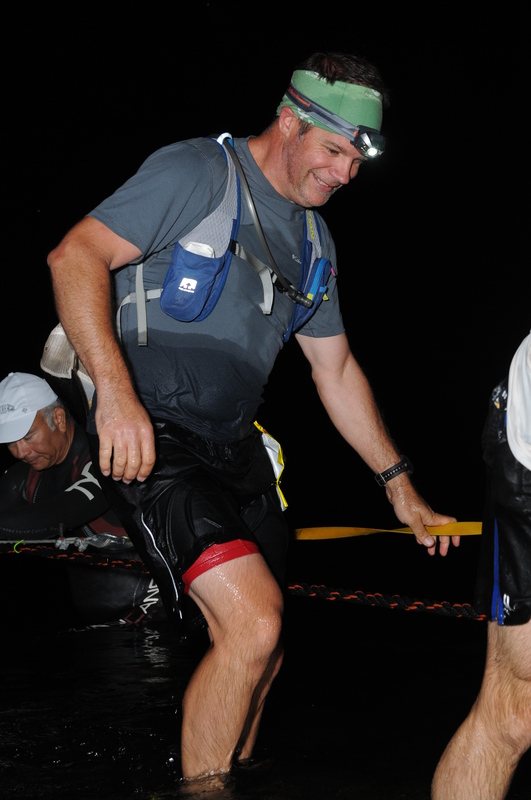 We crossed the river (mile 78) which was cold and came up to my chest but it was an exciting part of the race that I had been looking forward to. The only difference was that I had hoped it would have been a little earlier and therefore warmer at that point. However I made it across, changed into dry clothes, and continued on with Jim who provided lots of encouragement and awesome guidance given his strong knowledge of these trails. Unfortunately prior to Auburn Lakes Trail AS (mile 85) I started swaying again. Jim was in favor of another quick nap given how strong I had run following my stop at mile 73. I knew the sun was about an hour from coming up but I felt like a 10 minute power nap might recharge me for a strong finish. Given that I had plenty of time to finish, I crashed again with Jim being a trooper and waiting for me once again. I left Auburn Lakes feeling good and I only got stronger and faster as the sun rose. Jim and I were having fun during these last 15 miles and I continued to feel great as we passed one runner after another. It didn’t mean anything to be competitive at that point but it helped the time go by more quickly. As we started to descend to No Hands Bridge AS (mile 97), I got my phone out so I could videotape running into that aid station as well as having it available for going into the finish. I would never do something like this normally as it wastes time. However I wasn’t in a rush and since my family wasn’t with me, I thought it would be a fun way to capture the most important part, the finish. The other thing I would never normally do is to have alcoholic beverage during a race. I rarely drink when I am not racing but I indulged at mile 19 of The Boston Marathon when my race didn’t go as planned. 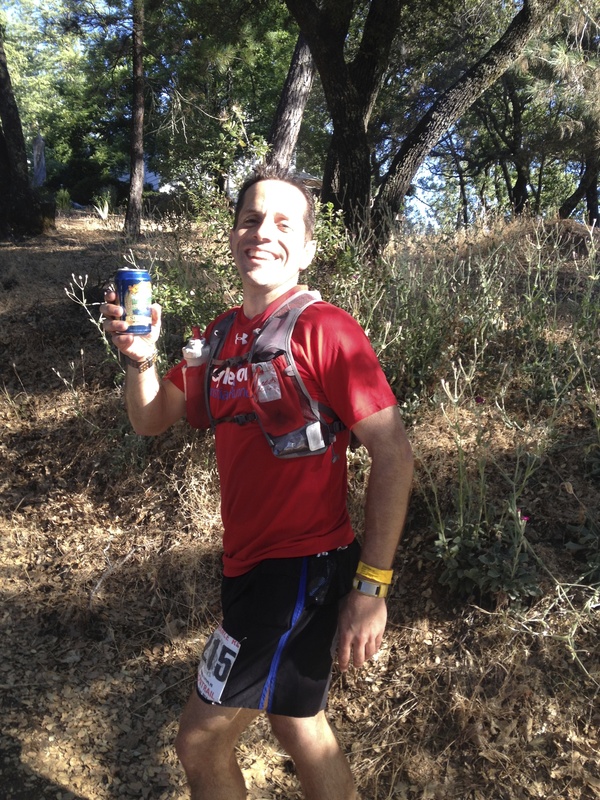 Given the circumstances once again, I grabbed another beer that was offered to me at mile 99 with Jim. We descended down the last hill and I could hear the other runners being announced as we got close. Running onto the track at Auburn was everything I had hoped it would be (although I thought it would be darker and about 4 hours earlier). 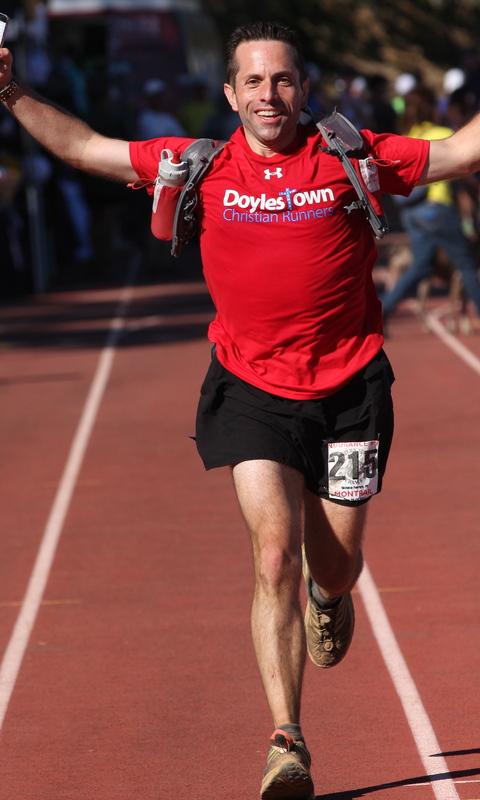 Crossing the finish-line was a great experience and one I would love to do again. Although I had my iPod with me from mile 62, I found it to be more of a distraction and only listened a short while. However, it didn’t stop this same song from playing in my head for most of the race. In addition to this song, I prayed a great deal during this race. What was truly humbling and reassuring is that I know many others were praying for me all over the country. The support I received prior to this race meant so much and I am blessed to have the support at home, with Doylestown Christian Runners, and so many others friends. 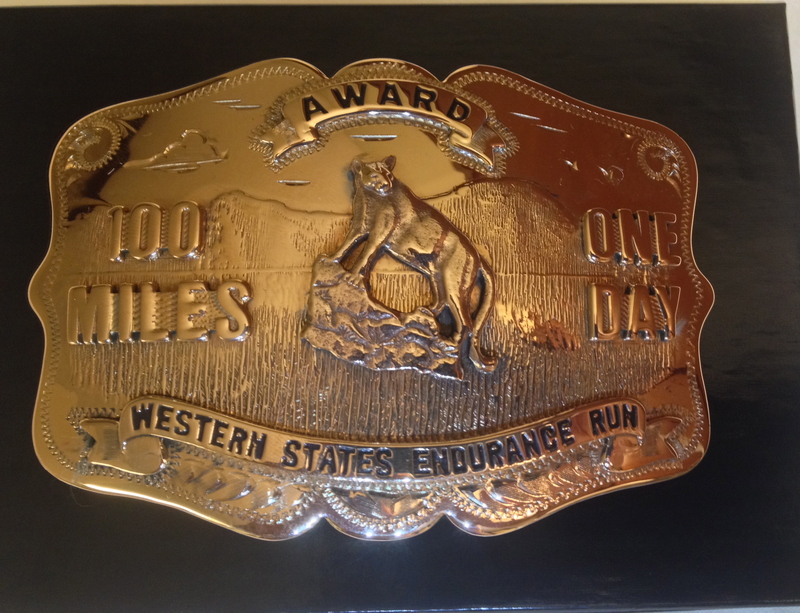 Similar to other races this year, Western States 100 didn’t go as planned but I made the best of it! I realized that although my body did not want to perform as I had planned, I was part of something special and I never want to give up. It is this mental approach to facing challenges that I need to embrace more often in my personal and professional life. I want to instill this in my kids so that they can see how to make the best of a situation that may not go as expected. Whether it is a 5k, 100-mile race, or life, time is too precious to dwell on what didn’t go as we had planned but to reassess, refocus, and move forward with a positive attitude as quickly as possible. The one benefit of taking my time to run this race is that I recovered in record time. Other than some soreness in my quads the following day, I felt great. This is good news given that my next race is now only 4 weeks away as I tackle the inaugural run of Eastern States 100. I have heard this is a challenging course and I’m glad that I finished WS100 in good shape. I can’t thank all of you enough for being with me on this journey. I know this has been another event that has taught me more than I can fully appreciate today and will likely impact me for years to come. Stay tuned as I share more about this race and my next 100. This entry was posted in Challenging, Doing our best, Goals, Romans and tagged Faith, fitness, Jesus, ulcerative Colitis, Ultra, Ultramarathon, Ultrarunning, western states. Bookmark the permalink. Congratulations. I saw you in Church yesterday but couldn’t catch up to you to get your report. It’s been a blessing to read this instead! What an amazing report! I’m going to re-read it now. Glad to hear you recovered so quickly. I’m reposting an interview with Far North Endurance Blog with me and my husband pre VT100. I hope you check it out. Nick, thank you. Please come to VT. Whatever support you’d need, it’d be provided. Plan on bringing the family & we’ll see that you are well cared for. It’s such an amazing event. AND it’s not that far! You never fail to amaze me! Your stamina, endurance and perseverance are astounding! As I read over your blog, I almost feel as though I’m running with you……well not really, but you certainly share your thoughts well:-). Not only are you a talented runner, but you can write too! What a blessing you are in showing how you give it all to the Lord every time you run. I’ll never listen to “Fix my eyes” the same way again. Lurleen, you are such a wonderful and supportive friend! Thank you for your kind words and compliment. I love that song and hope I never get tired of it… I am sure I won’t get tired of hearing the message within. That’s a nice ice cap! 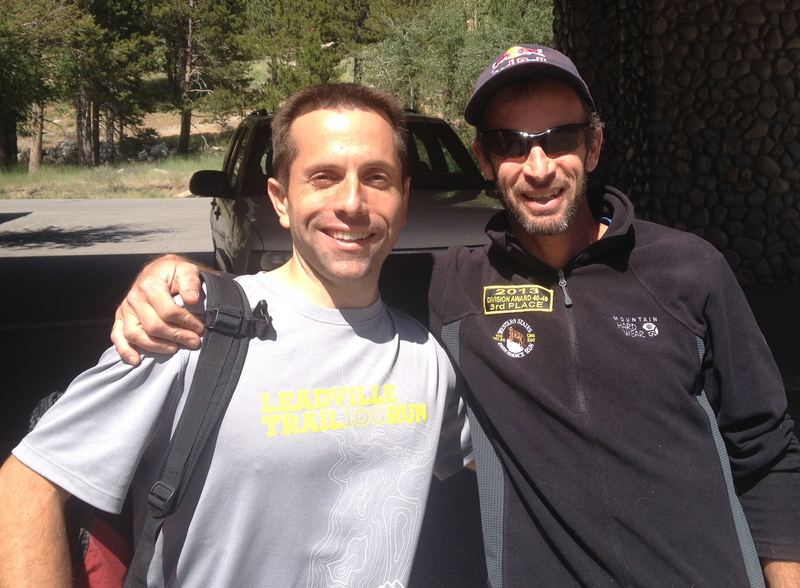 Congrats on your Western States finish! Such an accomplishment! Thanks Tina! It was a great race and one I hope to get another chance at. BTW- THANKS also for the link on your recent post! Greatly appreciated!